Digital Infrared Thermal Imaging (DITI) – The only method available for “Visualizing” your pain. Digital infrared thermal imaging is a non-invasive clinical imaging procedure for detecting and monitoring a number of diseases and physical injuries by showing the thermal abnormalities present in the body. Images or Thermograms can be taken of the whole body of just areas being investigated. The digitized images are sent to a Thermologist for interpretation and reporting. Your report will be printed for you and can be also be sent to your healthcare professional. This quick and easy test starts with review of your medical history before partially disrobing for the scan to be performed. The scan will take less than an hour and you will receive a printed report within 10 days. 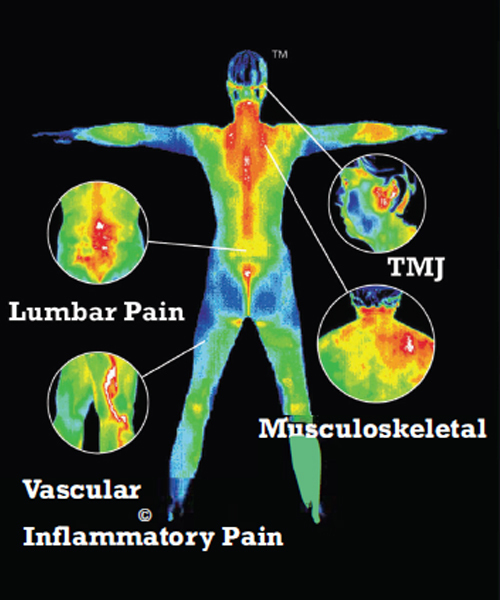 Areas of pain or disease show up on scans as red or “hot” areas, since the affected sites are usually inflamed. DITI scans are used to monitor injuries during treatment or refer to an appropriate healthcare professional. Breast Health – Increase your chances of detecting breast cancer in its earliest stages. The benefit of DITI testing is that it offers the opportunity of earlier dection of breast disease than has been possible through self exams, doctor examination or mammography alone. DITI detects the subtle physiologic changes that accompany breast pathology, whether it is cancer, fibrocystic disease, an infection or a vascular disease. Your doctor can then lay out a program to futher diagnose and/or monitor you during and after any treatment. All women can benefit from DITI breast screening. It can be especially helpful for younger women whose denser breast tissue makes it more difficult for mammography to be effective. For women of any age, this test can provide a clinical marker to the doctor or mammographer that a specific area of the breast needs particularly close examination.